Former Scottish First Minister Alex Salmond has provoked a backlash across the political spectrum after vowing to block the return of a Conservative government and help Labour into office in the event of another hung parliament. The ex-Scottish National Party (SNP) leader was accused by senior Tories of making a “deeply sinister” threat. They claimed he is seeking to “sabotage” the will of the British people. Labour described the move as part of a plot to keep Prime Minister David Cameron in power by damaging the party’s presence in Scotland, where they are threatened with electoral annihilation by the SNP. Salmond led the SNP’s unsuccessful ‘Yes’ campaign in the run up to Scotland’s independence referendum last year. Despite failing to win independence from the UK, the SNP’s popularity has grown exponentially since the referendum. The party is on course to win 43 of Scotland’s 59 seats, making it the third-largest party in Westminster, according to a Guardian/ICM poll published on Monday. Labour is expected to lose 29 of the 41 Scottish seats it won in the 2010 general election. The Conservatives could then lose power if the SNP and Labour were to vote against the Tories in a vote on the Queen’s Speech. Salmond predicts if Cameron were to lose a vote on the Queen’s Speech, it would prompt a no-confidence motion in the government, which would give Labour leader Ed Miliband an opportunity to take power. “The Tories would have to go straight effectively for a vote of confidence, usually the Queen’s Speech, although it could be otherwise, of course, and we’d be voting against. So if Labour joins us in that pledge, then that’s Cameron locked out,” Salmond told the New Statesman. “Alex Salmond has confirmed he would sabotage the democratic will of the British people in order to make Ed Miliband prime minister,” a Conservative spokesman said. Grant Shapps: 'Alex Salmond is threatening to undermine a government chosen by the British people'... aren't Scots British too? Party Deputy Chairman Bob Neill said: “This is a deeply sinister threat from Alex Salmond, who would do whatever it took to put Ed Miliband in Downing Street and under his command. “The policy demands he’s made public – higher taxes, uncontrolled immigration and uncertainty over Trident [submarine missiles] – would cause chaos for Britain. We just don’t know what else he would squeeze out of weak Ed Miliband,” he added. Labour sought to distance itself from any affiliation with the SNP, accusing Salmond of being in an “unholy alliance” to keep the Tories in power. “The SNP and the Conservative party have a shared interest in deeply damaging the Labour Party in Scotland,” a Labour source told the Guardian. Salmond’s detractors seized on comments made during the New Statesman interview, in which he compared himself with Nelson Mandela, the late-president of South Africa and anti-apartheid revolutionary. 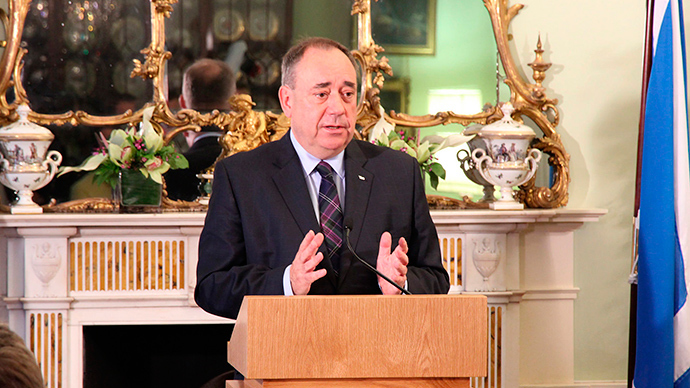 “Alex Salmond is fast becoming a figure of ridicule. This bizarre comment suggests that the former First Minister has unhinged himself from reality completely,” Conservative Member of the Scottish Parliament (MSP) Alex Johnstone said.